9News debuted a new political show this Sunday called “Balance of Power” starring our favorite journalist on TV, Kyle Clark, and a few Peak friends, including the big boss of Revealing Politics, Kelly Maher (get it?). Knowing that, it’s no wonder the show hit #2 in ratings on just its first segment. 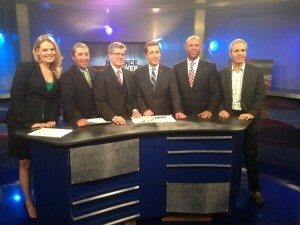 Thanks to everyone at 9NEWS (KUSA) and watching at home for making the premiere of Balance of Power the #2 rated Sunday show in town (behind Meet The Press, ahead of Face the Nation, Fox News Sunday & This Week). We’re already at work improving the show for next time. We’ll let you know when we have our next air date secured. If you haven’t seen the show check it out after the jump.